Plastic tubes and laminates printed with Schekolin lacquers. Courtesy of Siegwerk DruckfarbenPackaging is the fastest growth sector for ink producers in Europe. As a result, the vast majority of ink makers or ink technology developers are active in packaging. However, some segments of the packaging inks market, particularly high-volume applications, are becoming commoditized. The sector has reached a stage where numerous specialty and higher margin niches are being formed. These are areas of value-added products and services. For many ink producers, including small- and medium-sized businesses (SMEs), a core part of their strategy is to gain a strong presence within them. Ink companies can no longer rely on gaining sufficient profitability from standard packaging inks because otherwise they run the risk of continual erosion of their margins. In a recent report on The Future of Printing for Food Packaging to 2021, Smithers Pira reckoned that sales of food packaging inks would be growing at a faster rate in value than volume terms. This would be mainly because of tighter regulations and standards on food safety, particularly in respect of the dangers of chemicals from inks migrating through the packaging into the food product. In addition to safety, other factors generating value-added in packaging inks include greater visual appeal, lower environmental footprint, reduced raw material consumption, low weight and thin ink film. Another benefit rated highly by some end-users is security, such as brand protection against counterfeiters. This would include durable and mechanically readable printed features on the packaging for tracking and traceability. Not surprisingly, these demands have compelled packaging companies and their suppliers, particularly ink producers, to give greater priority to the development of new products. More funds have been allocated in packaging to the development of innovative and customized products. Ink producers have been bolstering their technical support. However, in most cases, innovation is not a stand-alone process but depends on cooperation and partnership. This collaboration ensures that specific requirements of the end-user are satisfied, and it also helps to spread costs. Ultimately, the objective behind these combined efforts is to ensure that all packaging components, particularly inks and coatings, help make the packaging an effective and efficient marketing tool. The availability of a greater variety of packaging technologies, including inks, are providing more of a level playing field in the marketplace. They are enabling SMEs to compete more effectively against their larger rivals. The quality of the design and printing of the packaging of the products of small companies can sometimes catch the attention of supermarket shoppers more effectively than those of established brands. SMEs have also been benefitting from their own innovations. Small technologically-oriented companies have established themselves in packaging niches through specialty technologies they have developed themselves. Some of these companies have been targeted for acquisition by larger competitors, who see takeovers as a way of expanding their portfolio of technologies and also as a means of entering new sections of the market. Siegwerk, which has been pursuing a strategy of focusing on packaging inks through a combination of acquisitions and divestments, earlier this year took over two specialist businesses – Hi-Tech Products and a varnishes operation of Schekolin AG. Hi-Tech develops and manufactures high-quality water-based flexo inks and coatings, mainly for corrugated board packaging. “This merger enables us to continue raising our profile as a supplier of water-based printing inks in Europe,” said Dirk Weissenfeldt, Siegwerk’s VP paper and board and liquid food packaging. The acquisition follows Siegwerk’s purchase last year of ACTEGA Colorchemie to expand production of water-based inks. The Schekolin business makes specialty UV varnishes for a wide range of plastic laminates and rigid tubes. Ink producers have also been stepping up investments in R&D and technical support centers specializing in specific packaging sectors. In April, Flint Group opened a Global Innovation Centre (GIC) in Malmö, Sweden, for paper and board printing, to reflect what the company called the “new normal” of strong support for packaging printers. The center, which includes an eight-station printing press with capacity for both water-based and UV printing, has been designed to aid “the development of products that will shape the future of paper and board printing,” according to Kim Melander, Flint Group’s VP sales for Europe, Middle East and Africa. Sophisticated analytical equipment and the staff to operate it are big items of expenditure for some packaging ink makers. These are needed to ensure that inks are compliant with regulations and standards on migration and other safety issues by being free of potentially hazardous substances, which often may damage inks through cross-contamination. The search for a competitive edge in packaging inks is increasingly being conducted through partnerships, usually comprising collaborations between ink producers and their customers or alliances of operators within a supply chain. A growing trend for customization of inks and other packaging components for end-users are sometimes only achievable through collaborations between suppliers. Sun Chemical has traditionally been active in forging partnerships and cooperation deals in the packaging sector. In the UK, it has just celebrated the 30th year of a partnership with Skymark, a flexible packaging manufacturer, to which it has been supplying almost all of its wet materials including inks, lacquers and coatings. In May, the company reached a collaboration agreement with HP Indigo on the development of cost-effective digital coatings for packaging. Earlier this year, it announced it had developed with Smurfit Kappa a digital laser-based coding system. This combines Smurfit Kappa’s flexo printed corrugated boxes with Sun Chemical’s SunLase coating technology, which enables laser marking of packaging at the end of manufacturing operations. The marking can be done at the typical speed of an automated packing line, providing an alternative to direct thermal labeling. Heidelberg and Fujifilm have this year started the first stages of launching Primefire 106, their jointly developed B1 sheetfed inkjet press, which will use Fujifilm’s printheads and inks. Multi Packaging Solutions (MPS), the machine’s first pilot customer, has been installing it at an MPS facility at Obersulm, Germany, where it will be primarily printing folding cartons. Digital printing has already been accelerating its expansion in different segments of the European packaging market. Some analysts now estimate that it has an average share of approximately 20% in the sector. 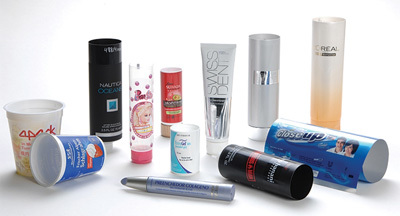 In some areas it has become the main means of adding value to packaging printing. Digital processes are now being applied in the corrugated and cartons segments and in flexible packaging, where it could challenge the dominance of flexo. Inkjet and electrographic technologies are well placed to respond to the trend toward an enormous variety of packaging designs stemming from products being supplied in smaller volume to target specific groups of consumers. In some sectors, particularly food, confectionery and personal care, the same product is sold in a range of sizes with different packaging. At the same time, the versatility of digital is suited to the greater variety of substrates in packaging. Flexible packaging uses a range of plastics, polymer composites and mixes of laminated materials. Cosmetics are now packaged in a multiplicity of grades of paper and board, foils, plastics, ceramics, glass, metals and woods. In addition, producers of cosmetics, luxury goods, confectionery and beverages are making greater use of special effects, including embossing and other three-dimensional embellishments, to add tactile as well visual appeal. Digital processes are also helping the development of new techniques for direct-to-object printing of packaging products like glass containers and metal cans. In the printing of identification codes on product packaging, inkjet is emerging as the most efficient process at meeting the requirements of tighter regulations on the tracking and tracing of foods and medicines. A new European Union regulation on combating counterfeit medicines will soon require the serialization or unique identification of each medicine pack. The growing complexities of regulatory, environmental and commercial requirements in packaging will give greater scope for value-added inks and coatings.